Enviar una solicitud de disponibilidad con las fechas que desee a Hôtel de Crillon, a Rosewood Hotel. Located on the first through sixth floors, Deluxe Rooms look out to the quiet pedestrian street, Rue Boissy d'Anglas, or one of the hotel’s stately inner courtyards. Offering a refined, residentially styled environment, the rooms feature custom art and a spacious marble bathroom along with the choice of a Queen or King-size bed. Features include Wi-Fi Internet, in-room Bluetooth sound system, Rivolta Carmignani Italian linens, fine French pillows and duvets from Drouault, underfloor heating in bathroom, separate walk-in rain shower and bath, bespoke toiletries, salon-grade hairdryer, digital scale, TV in bathroom mirror, section of national and international newspapers, welcome refreshments, Nespresso coffee machine and a personal bar with complimentary snacks and non-alcoholic beverages. In-room check-in available. Located from the first through sixth floors, Premier Rooms look out either to the quiet pedestrian street, Rue Boissy d'Anglas, or one of the hotel’s stately inner courtyards. Offering a refined, residentially styled environment, the rooms feature custom art and a spacious marble bathroom along with the choice of a King or Queen-size bed. Features include Wi-Fi Internet, in-room Bluetooth sound system, Rivolta Carmignani Italian linens, fine French pillows and duvets from Drouault, underfloor heating in bathroom, separate walk-in rain shower and bath, bespoke toiletries, salon-grade hairdryer, digital scale, TV in bathroom mirror, section of national and international newspapers, welcome refreshments, Nespresso coffee machine and a personal bar with complimentary snacks and non-alcoholic beverages. In-room check-in available. Comfortable Parisian room with 1 King bed and views of the courtyard or Rue Boissy d’Anglas. From the first to the sixth floor, the Grand Premier Rooms capture the spirit and charm of a modern Parisian residence with ample space. Features include Wi-Fi Internet, in-room Bluetooth sound system, Rivolta Carmignani Italian linens, fine French pillows and duvets from Drouault, underfloor heating in bathroom, separate walk-in rain shower and bath, bespoke toiletries, salon-grade hairdryer, digital scale, TV in bathroom mirror, section of national and international newspapers, welcome refreshments, Nespresso coffee machine and a personal bar with complimentary snacks and non-alcoholic beverages. In-room check-in available. Mirroring the heritage and charm of a Parisian residence, Deluxe Suites face either the quiet pedestrian street, Rue Boissy d'Anglas, or one of the hotel’s stately inner courtyards. Designed in a quintessentially French style, the suites offer a separate living room, spacious bedroom and large marble bathroom along with 1 King bed. Features include Wi-Fi Internet, in-room Bluetooth sound system, Rivolta Carmignani Italian linens, fine French pillows and duvets from Drouault, underfloor heating in bathroom, separate walk-in rain shower and bath, bespoke toiletries, salon-grade hairdryer, digital scale, TV in bathroom mirror, section of national and international newspapers, welcome refreshments, Nespresso coffee machine and a personal bar with complimentary snacks and non-alcoholic beverages. In-room check-in available. Embodying the Parisian residential sensibility that defines Hôtel de Crillon, Premier Suites face either the quiet pedestrian street, Rue Boissy d'Anglas, or one of the hotel’s stately inner courtyards. Decorated with elegant bespoke furnishings and artwork, the suites offer a separate living room, spacious bedroom and large marble bathroom along with 1 King bed. Features include Wi-Fi Internet, in-room Bluetooth sound system, Rivolta Carmignani Italian linens, fine French pillows and duvets from Drouault, underfloor heating in bathroom, separate walk-in rain shower and bath, bespoke toiletries, salon-grade hairdryer, digital scale, TV in bathroom mirror, section of national and international newspapers, welcome refreshments, Nespresso coffee machine and a personal bar with complimentary snacks and non-alcoholic beverages. In-room check-in available. Embodying a Parisian residential sensibility, this one-bedroom suite faces the quiet pedestrian street, Rue Boissy d'Anglas, or one of the hotel’s stately inner courtyards. Decorated with elegant bespoke furnishings and artwork, it offers a separate living room, spacious bedroom with king bed, and large marble bathroom with dual vanities, walk-in shower and separate tub. Features include Wi-Fi Internet, in-room Bluetooth sound system, Rivolta Carmignani Italian linens, fine French pillows and duvets from Drouault, underfloor heating in bathroom, separate walk-in rain shower and bath, bespoke toiletries, salon-grade hairdryer, digital scale, TV in bathroom mirror, section of national and international newspapers, welcome refreshments, Nespresso coffee machine and a personal bar with complimentary snacks and non-alcoholic beverages. In-room check-in available. The Suite Jardin overlooks the" Cour d'honneur” with a private outdoor terrace. 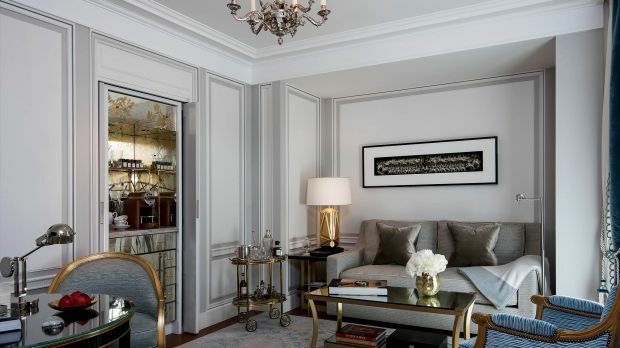 This suite embodies the Parisian residence style that defines Hôtel de Crillon. Featuring bespoke elegant furnishings and Artwork Collection, the Garden Suite offers a separate living room and spacious bedroom. Features include a large marble bathroom offering 2 sinks, a walk in shower and separate bathtub. Special service and amenities include full butler service, Wi-Fi Internet, fully stocked personal bar with courtesy water, juices, soft drinks, beers and snacks. Complimentary one hour pressing of 3 garments upon arrival.